Photos of Whidbey Island, Washington, and its surrounding areas by Janet Kincaid. 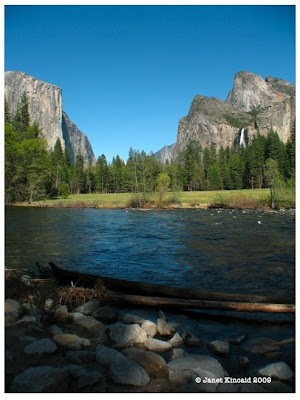 Yosemite National Park--a great place to receive a job offer! P.S. On another note, the folks at City Daily Photo Blog won't approve this blog for inclusion in CDPB because it covers the entire island and not just one city on the island. I understand their rules for inclusion and don't dispute them, but I'm trying to decide whether to change this to Langley Daily Photo so it can be included or just let it go and hope for the best. What do you think, fellow photo bloggers? When I step outside the place where I live, this is my view. Of course, I have to look up to see it obviously. The best part about these trees is when the wind moves through them. It makes the most amazing sound. Other than that, it's pretty quiet in these parts. Welcome to Whidbey Island Confidential. For those of you who have been following my photography for the last year or more, you know my work as D.C. Confidential. I've recently relocated to Whidbey Island from Washington, D.C., and this is my daily photo blog. I'm putting this up mostly so my family and friends can see where I'm living, but I'm also doing this because I enjoy photography, learning and seeing new things, and writing. This is my outlet for all of that. If, along the way, you think there's something I should photograph in Island County, Washington, give a holler. I'm open to adventure. As for Whidbey Island itself, I look forward to covering this impressive bit of real estate. If you see me out and about with my camera, give a shout and I'll shout back! Most of what you see on Whidbey Island Confidential will be specific to the island itself, as well as the surrounding islands that make up the county. In addition, forays to places like Seattle, Tacoma, Olympia, the Coast, and anywhere else I travel may end up here. In other words, same format, different locale. Hope I can do my new digs as much justice as I did my old.